Foreign Room: My 23rd Birthday! 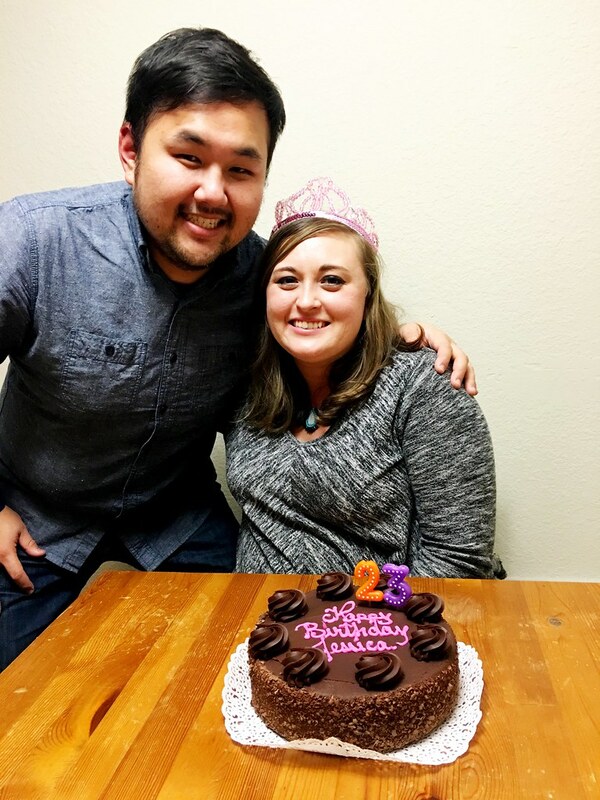 Yesterday was my 23rd birthday! I’m just going to go ahead and say it: I am the kind of person that loves their birthday. I LOVE my birthday. It is always a special day to me, as it should be. I love having the excuse to spend the day doing whatever my heart desires and I think everyone deserves to feel special on their birthday. It is just an exciting day! The day started out with my roommate Laura making me delicious crepes for breakfast. Dai surprised me by taking the day off of work and showing up at my house at breakfast time, although I had a hunch he was taking the day off even though he kept insisting that he was going to work just like any other normal day ;) After breakfast, Dai and I went to a good local coffee shop that I really like near my house and they were so sweet to give me my latte for free since it was my birthday! 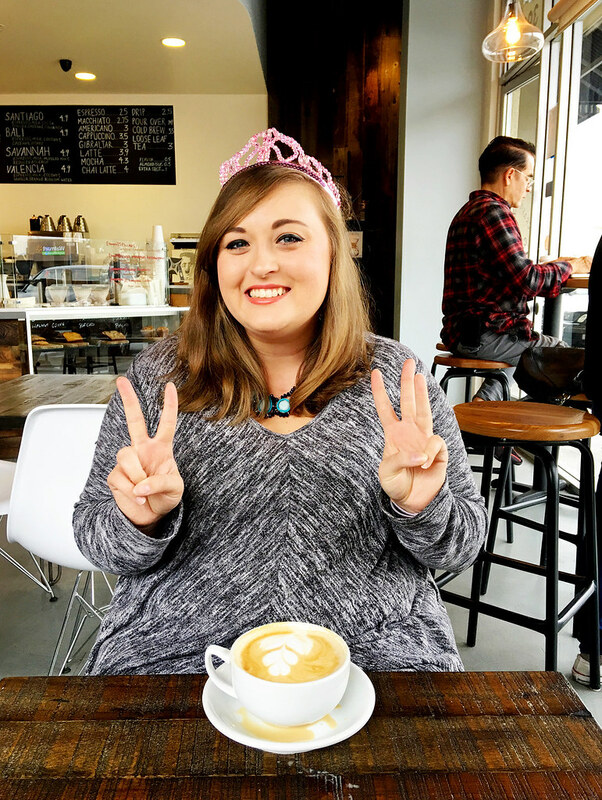 Perks of being the birthday girl and wearing a birthday crown :) We then headed to the movies to La La Land. It was at this really nice theater that has reclining leather seats and since it was a rainy Wednesday at 11:30am, there weren’t many people there, which was also nice! La La Land was really good and it is now one of my favorite movies! It is so fun and just all around lovely. I highly recommend going to see it! After the movie, we went to lunch in downtown Palo Alto at Lemonade, which as always was really yummy. We also walked around West Elm (love everything there!) and had fun sitting on the couches. We then went to the Stanford mall and I ended up finding a beautiful dress to wear to Dai’s company holiday party later this month (yes it is in January!). After the mall, we got a milkshake and walked around Sur La Table. I knew that Dai had plans for us at 6:30pm, but I had no idea what they were. I thought maybe they were dinner reservations or something. As we were walking around Sur La Table, Dai led me towards the back of the store where he revealed that we were doing a cooking class! It was pizza making and we got to make everything from scratch! 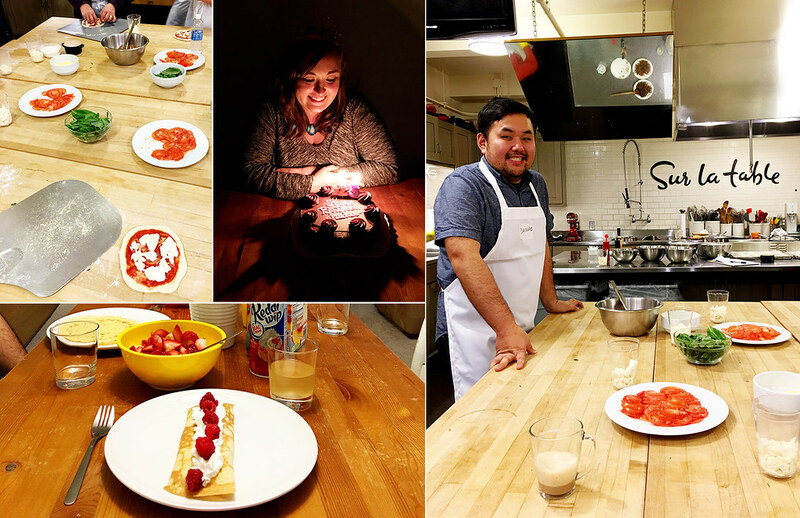 I had never done a cooking class before, but it was something I had thought would be fun to do with Dai. We had a great time and made super tasty pizza. It was a fun experience and I would love to do another class! As you can see, I had a really wonderful day! I know that I am one lucky girl to have a guy that does anything to make sure that I feel special. He is like that all year round, actually, not just on my birthday and it is one of the many things I love about him. He is always thinking up things to surprise me with and doing things to bring a smile to my face :) I am so thankful for you, Dai! The celebrating isn’t over yet! On Friday I am meeting up with some friends for drinks and we may go bar hopping to check out a few different places. Next week I am also heading to Vegas with two of my girl friends for a couple days of fun! I am really looking forward to that as well since it will be my first real time in Vegas with friends! I am excited for 23 and all that this year will bring. I know it will be a good one!